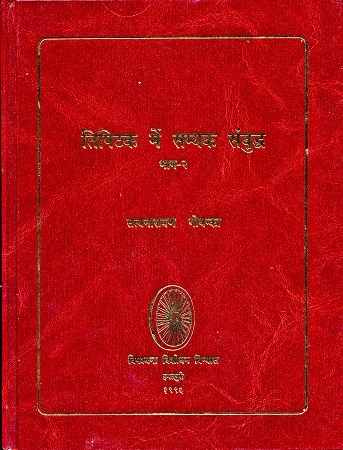 Second volume of the Introduction to the Tipiṭaka. Written in Hindi language. "What distinguishes this presentation is Goenkaji's sparkling enthusiasm for spreading the message of the Buddha. This he does by most skillfully giving precise quotations of the words of the Buddha in response to the questions of his lay and mendicant followers. The entire work thus becomes a garland of flowers, to use a Buddhist metaphor, in the form of the Buddha's own great utterances. Goenkaji's eagerness to share his happiness in Vipassana and his insights into the sublime essence of Buddhism will inspire and uplift those who read this book. The Hindi-speaking world owes deep gratitude to the author for this lucid and enlightening introduction to the heart of Buddhism." "Tipiṭaka men Samyak Sambuddha has two parts. In part 1 Goenkaji has explained what piṭaka actually means and when and why the Tipiṭaka was recited. Against the views of others who interpret piṭaka as basket he interprets it as scripture which is corroborated by the Buddha's use of the word in Kesamutti sutta and other suttas. He has also brought out the physical beauty of the Buddha who had 32 marks of a great man and which attracted some of the disciples to him. But against this perishable physical body (rūpa kāya) he has also shown the imperishable Dhamma kāya (teachings of Buddha) of the Buddha. Dhamma kāya is not only imperishable and immortal but also infinite, deep and immeasurable like the sea. It is infinite because it is taught by One whose cravings that make one limited are rooted out in the same way as a palm tree is cut which can never grow again. After this Goenkaji has explained four out of the nine qualities of the Buddha here with examples culled mainly from the Sutta pitaka such as he is an arhat, he is perfectly enlightened, he is endowed with vijjā (wisdom) and ācaraṇa (conduct) and is sugata i.e. whose physical, vocal and mental actions are pure, faultless and unblameworthy . The Pali quotations given here from the Tipiṭaka to illustrate the point have been translated into Hindi so that readers who do not know Pali can enjoy reading the book and understand what Goenkaji wants to say. In the second part he explains the other five qualities of the Buddha such as the Buddha is a lokavidū i.e. he is a knower of the world. In other words, he does not only know the world but he also knows how it comes into being, how one can transcend it and go beyond it and how it can be eliminated. Besides these, the Buddha is an incomparable charioteer and knows very well how to tame the people who are to be tamed just as a charioteer trains a horse of good breed. The Buddha trains people in such a way that not only their life becomes virtuous but also they do good to others who come in their contact. He chisels them in such a way that they become very useful for society besides being good for themselves. The Buddha is a teacher of gods and men and he does not teach them what he has heard from others, nor does he teach them what is irrefutable by logic but he teaches them what he has himself experienced and, therefore, he is a different kind of teacher. He is the Buddha who attained bodhi himself, without the help of any teacher and has become cool and quenched. He teaches people to observe noble silence so that they can practice meditation, remove defilements that cause their suffering from their minds, realize impermanence, suffering and no-self, develop non-attachment to all objects of the world and attain peace and happiness. The Buddha is called Bhagavā because he has destroyed all cravings (rāga), all aversions (dosa) and all ignorance (moha). He has earned this name by dint of his own efforts. This name has not been given to him by his parents or other relatives. The Buddha was a great man who thought good of all. He taught his Dhamma to all in such a way that they enjoyed listening to it and putting it into practice in their life. He had a sense of humour also as is evident from what he said to Akkosaka Bharadvaja. All these aspects of his personality have been highlighted with apt quotations from the Tipiṭaka along with their Hindi translations. Goenkaji has also brought out one important aspect of Dhamma. The Buddha says that Dhamma should be used just as a raft to cross the ocean of becoming and after crossing, it should not be carried by one on his shoulders. The meaning is that one should not develop attachment even to Dhamma. In this way Goenkaji has highlighted the important aspects of Buddha as he culled them from a deep study of the Tipitaka. Both parts of the TSS contain Hindi word index, Pali word index, index of sutta, gāthā and vatthu and index of proper names. The way the book has been written and the quotations from the Tipiṭaka with their Hindi translations have been given make it a very interesting reading and one can know all important aspects of the personality of the Buddha and his Dhamma from it. This book can well be said to be an ocean in a pot." Find the other books in the series below in the "Related Items" section.